SIOUX FALLS, S.D. 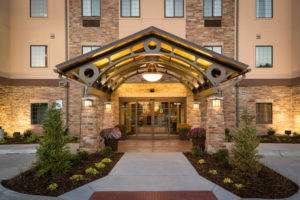 – Intercontinental Hotels Group (IHG) has awarded the Staybridge Suites – Omaha West with the 2016 Winning Metrics Award. The award is earned by accomplishing a perfect score of 5 out of 5 for their Heartbeat, Problem Handling, Loyalty Recognition, Loyalty Enrollments, and Guest Review scores. The IHG Winning Metrics takes into account all aspects of a hotel’s operation from revenue to cleanliness and is a target for all IHG hotels. There are over five thousand IHG hotels eligible for this award and only 220 hotels, or 4 percent, were honored in 2016. This is the only Staybridge Suites branded IHG hotel to win the award in the entire Midwest region. The Staybridge Suites in West Omaha, Neb. opened in September 2016. The four-story, 99-room all-suite property is located at 2720 Oak Drive in west Omaha, near the intersection of West Center Road and South 168th Street. It is owned by West Center Lodging, LLC and is managed by Hegg Hospitality Management, LLC.